On August 12, at the opening ceremony for the Music Village, participants observe the exhibition for more than 3000 music materials at Ichibangai, Okinawa city. The Music village is a part of a community development project using music sponsored by Okinawa City. The city aims to make use of music, art and culture as resources to develop the community. 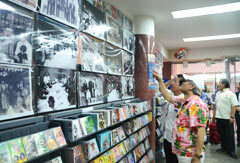 The city started to collect music sources in 2012, and more than 3000 photographs and sound sources are on display. The Music Village opens from 11 a.m. to 7 p.m., and closes on Monday, public holiday, year-end and New Year holidays. For more information, please call Music Village 098 (923) 3224.